Elonex has launched a Times Square style Wraparound Digital Billboard at the heart of Birmingham City Centre. The new large-format digital billboard, named Birmingham Lights, is the first of its kind in the city and wraps around two sides of The Square building in typical New York fashion on the busy corner of Bull Street and Corporation Street. Now live, the new digital structure is elevated to be clearly visible in its central location to huge city centre audiences. 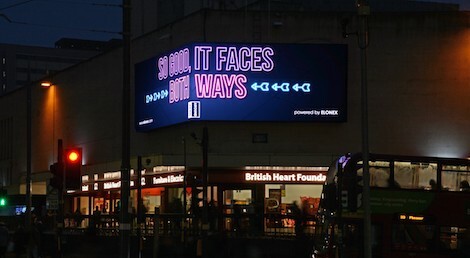 Positioned opposite House of Fraser and Martineau Place, Birmingham Lights broadcasts digital out of home advertising content in two different directions. With one side facing the route to Bullring Birmingham and Grand Central, and the other to Colmore Row and Snow Hill Station. The wraparound billboard can be utilised by advertisers as one continuous 96 sheet digital screen or as two separate 48 sheet digital screens, to provide the ultimate canvass for the most creative marketing campaigns. In addition to its UK-wide digital inventory, Birmingham Lights going live is the latest in a growing number of LED advertising screens Elonex operate in and around the second city, and comes shortly after the firm launched its flagship digital structure, StarLights™ at Spaghetti Junction on the M6 and unveiled a brand new 48 Sheet digital billboard on the A38(M) in late 2017.